For more information and to register, email Jane at info@janeingramallen.com or phone 857-234-2432. Hope to see you at one of these workshops! With great pleasure, I am happy to inform you of your nomination and induction into the Hall of Fame for the Foundation for Scholarly Exchange. This new initiative follows on our successful celebration last year of “60 years of Educational Exchange in Taiwan.” As you know, the Foundation is the successor non-profit for the United States Educational Foundation in the Republic of China and took over all the responsibilities and obligations of the former in 1979. At our Spring Recognition Banquet on May 18th, 2018 we plan to announce the formation of the Hall of Fame and the initial inductees. You are cordially invited to join us for the announcement. We understand that with short notice you are unlikely to attend, but we hope that you will consider joining us or sending a brief email. significant public and private contributions to international educational exchange, and commitment to the Fulbright vision of a better world. 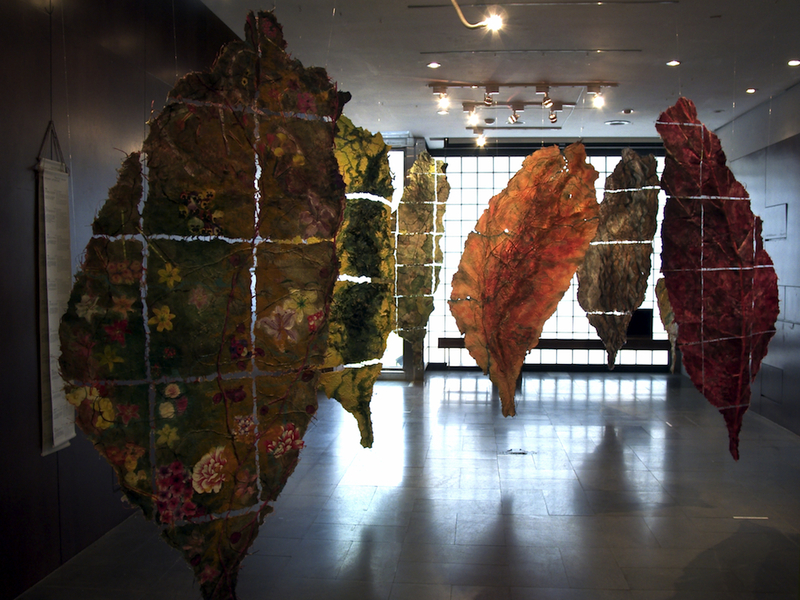 I was a Fulbright Scholar in Taiwan in 2003-04 and 2004-05, and completed an 18-month research project I called “Made in Taiwan” to make my art with handmade paper from plants of Taiwan. 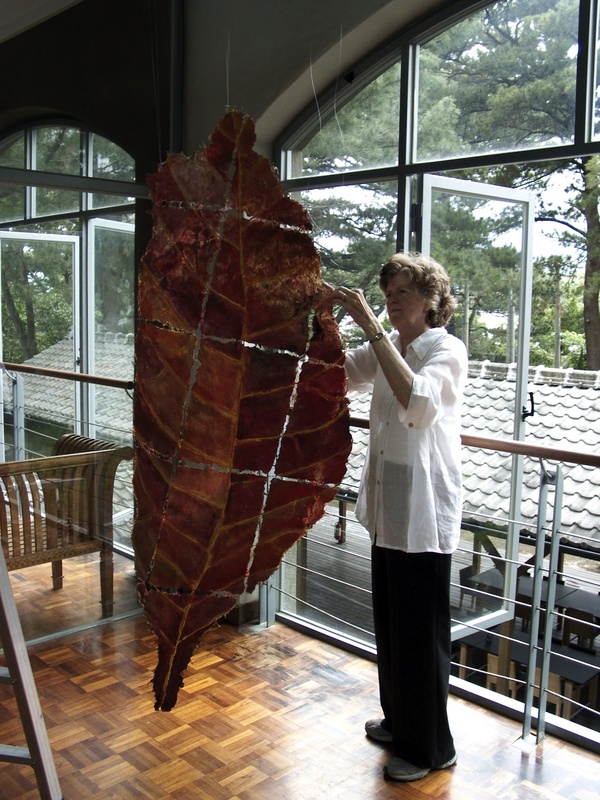 As a Fulbright grantee I spent the first 6 months based in Taipei as an artist in residence at the Suho Memorial Paper Museum and the next 12 months traveling to 13 different parts of Taiwan hosted by various organizations and making handmade paper for my artworks from bark and leaves of 135 local plants. 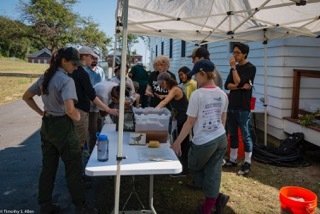 During the residencies in each community I cooperated with local plant experts and also exhibited my artwork and taught workshops for the community about hand papermaking using local plants. The artworks I made for this project were what I call “site maps” that depicted the geography of the place and were made entirely with materials collected in that place. The two-sided mixed media “site maps” were displayed in each place, and the collection grew to include approximately 53 artworks “made in Taiwan”. 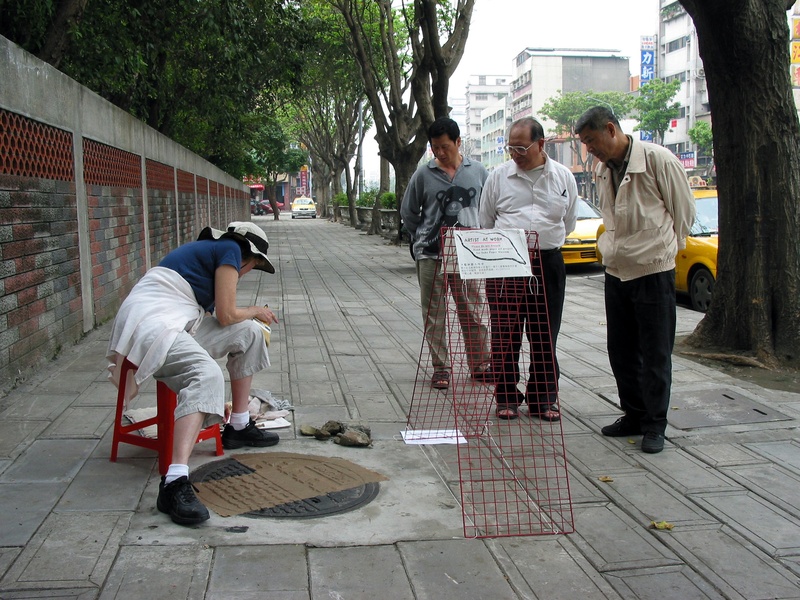 Putting my handmade paper to dry on a Taipei manhole cover in 2004 to create a Taipei Site Map. 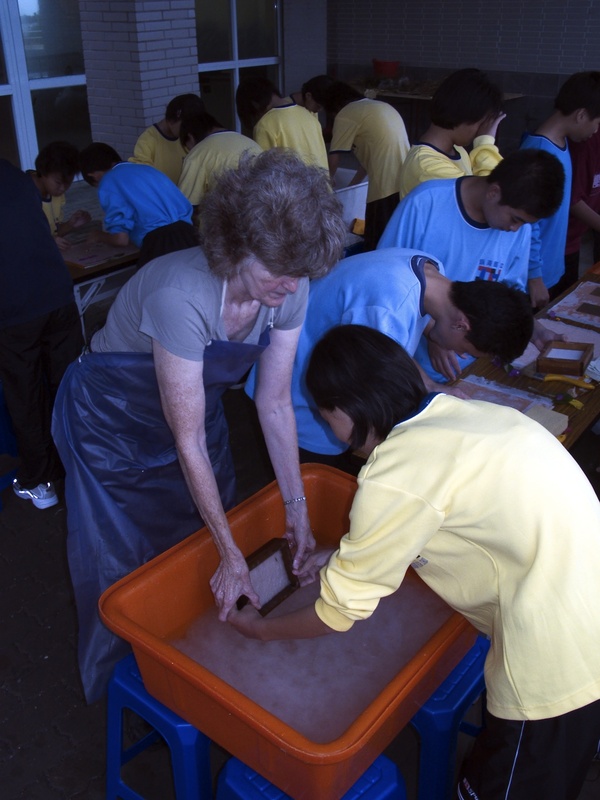 Teaching a handmade paper art workshop in 2004 in Yilan County, Taiwan, at a local elementary school. At the end of my grants my husband Tim and I decided to stay in Taiwan, and we lived there full time until August 2012. I have continued to do art projects in Taiwan involving community people, schools and universities as well as NGOs and other institutions in Taiwan. I also started environmental art projects to bring other international artists to Taiwan who join with Taiwanese artists using natural materials and working with issues concerning the environment. I started the Guandu International Outdoor Sculpture Festival at Guandu Nature Park in Taipei in 2006 and the Cheng Long Wetlands International Environmental Art Project in Cheng Long village, Yunlin County in 2010 and the National Museum of Marine Science and Technology International Marine Environmental Art Project in 2015. 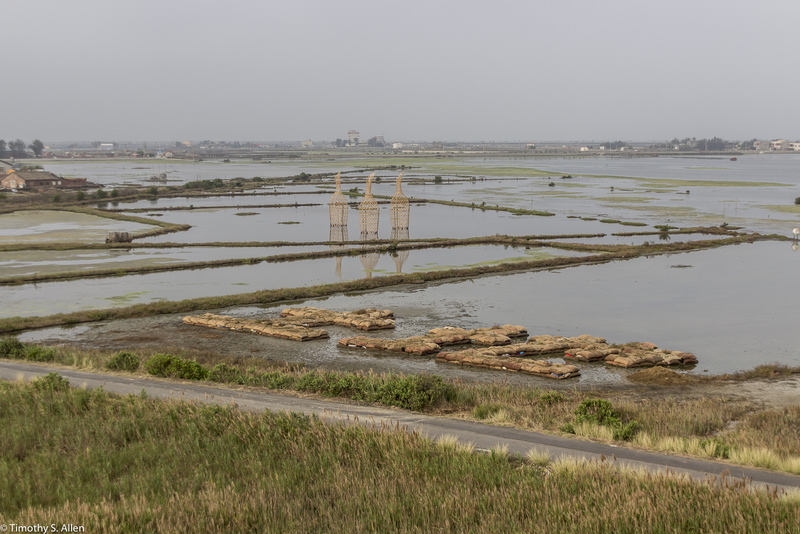 Cheng Long Wetlands International Environmental Art Project, installations done in 2015 by Marisa Merlin and Roger Rigorth. I am very happy to be awarded the honor of being in the Taiwan Fulbright Hall of Fame. I feel like Taiwan is my second home and it is a beautiful place with wonderful people who recognize the value of art and its role in preserving our environment and helping to make a better world. Thank you to the Foundation for Scholarly Exchange for this honor, and I plan to continue my work in Taiwan. 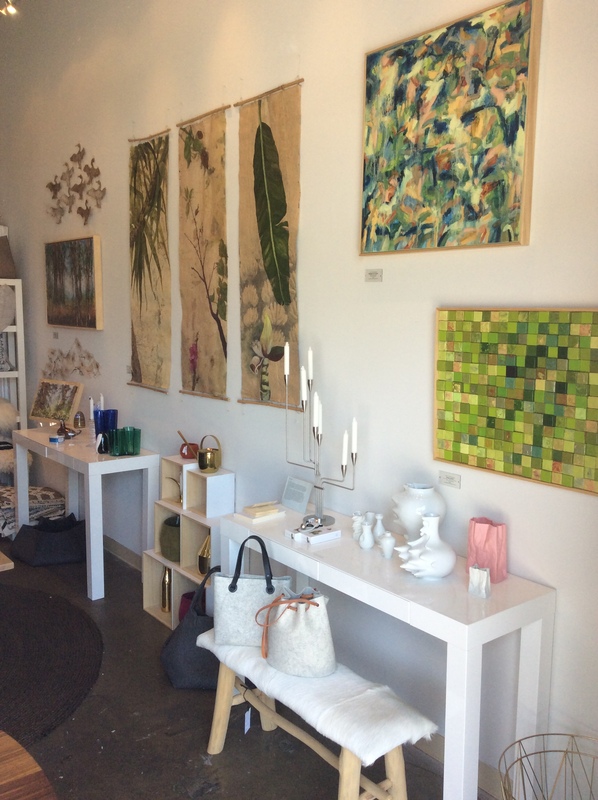 In this workshop we will explore the process of making and using handmade paper to create three dimensional sculptural forms. If you’ve ever been curious about how to create organic and molded paper shapes to use for art and craft projects this workshop is for you! 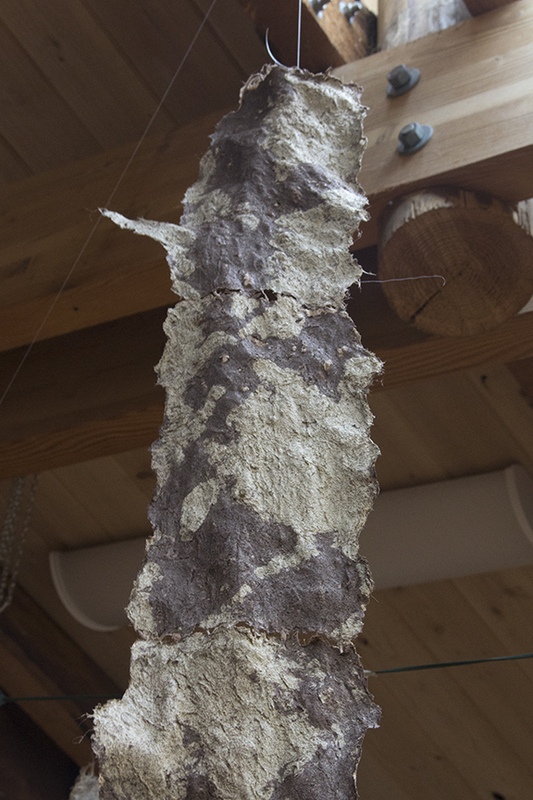 We’ll create armatures with sticks and wire and use abaca and other plant fiber handmade paper to cover our armatures and molds. Issues of transparency, opacity, and shrinkage will be discussed. At the end of the class students can either carry their wet projects home or leave them to dry in the studio and pick them up the following week. Great for those with some previous papermaking experience, though we will review basic sheet forming, and no experience is required. Class size is limited to 5 students. Workshop fee is $100, and includes cost of materials. Contact Jane by email at info@janeingramallen.com or phone 857-234-2432 to register. Registration and deposit of $50 must be received by June 16, 2018, and the balance of $50 can be paid at the class. Use PayPal (www.paypal.com) to send by credit card or send check to Jane Ingram Allen, 315 Algiers Court, Santa Rosa, CA 95409. 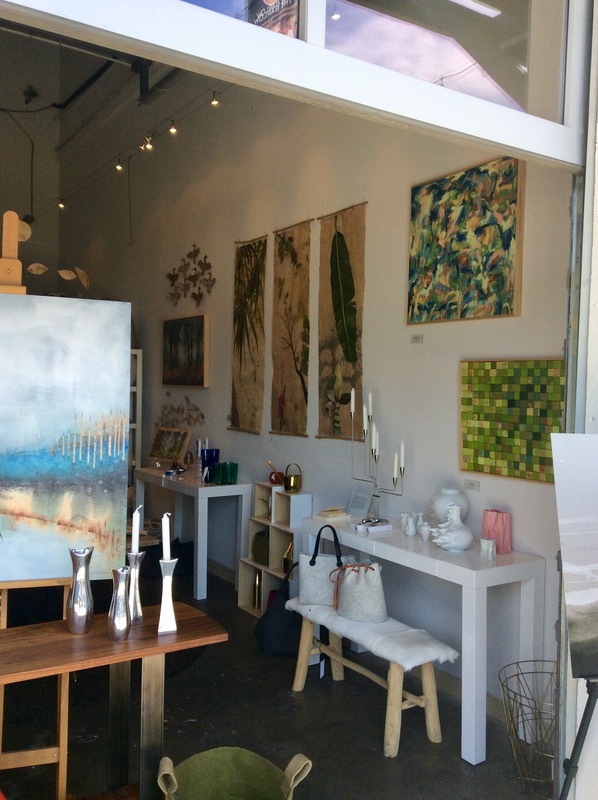 In this class Jane will share her experiences about how to increase your chances to get residencies, grants and exhibition opportunities and how to make your proposal stand out. She will give information from her perspective as a juror and artist. 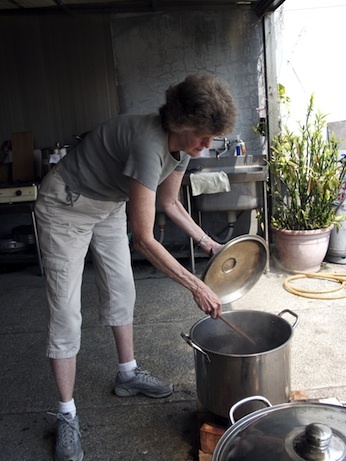 Jane has been a museum curator, independent curator, juror for art grants and residencies and a professional artist for many years who has received numerous grants, residencies and exhibition opportunities in the US and other countries, including Fulbright grants and NEA and arts council grants as well as support from foundations and museums. Writing statements and project descriptions and choosing visuals and other support materials will be covered. Participants can bring along an opportunity listing they are thinking about applying for. Examples of an artist statement, project description, images of previous works and resume can also be brought for discussion and suggestions. Bring your laptop to access digital images and files or bring actual photos and writing examples. Class size is limited to 6 students. Workshop fee is $50. Contact Jane by email at info@janeingramallen.com or phone 857-234-2432 to register. Registration and deposit of $25 must be received by June 2, 2018, and the balance of $25 can be paid at the class. Use PayPal (www.paypal.com) to send by credit card or send check to Jane Ingram Allen, 315 Algiers Court, Santa Rosa, CA 95409. 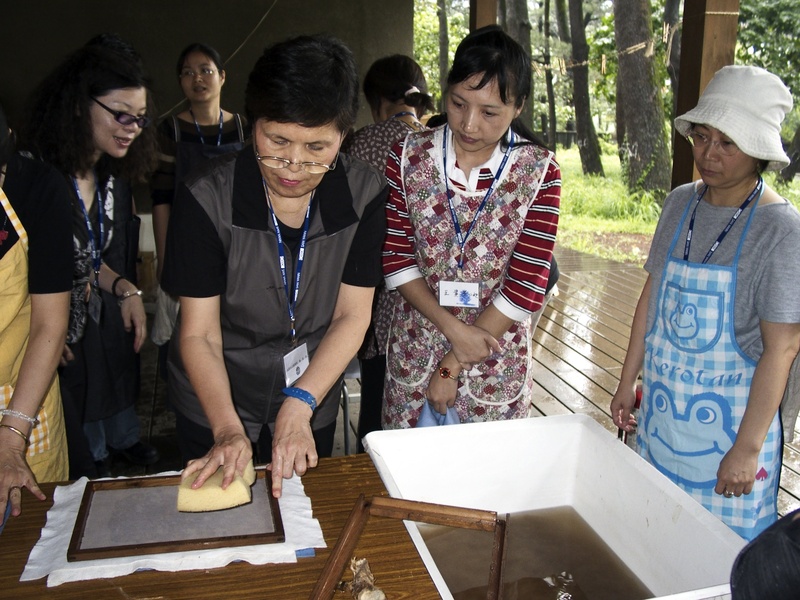 Learn to make your own handmade paper using a variety of plant fibers that are purchased from suppliers and also those that are prepared from local plant waste materials. We will cover both Western and Asian techniques and equipment for sheet forming. Use your own handmade paper for any art techniques such as drawing, painting, collage, printmaking, sculpture, etc. 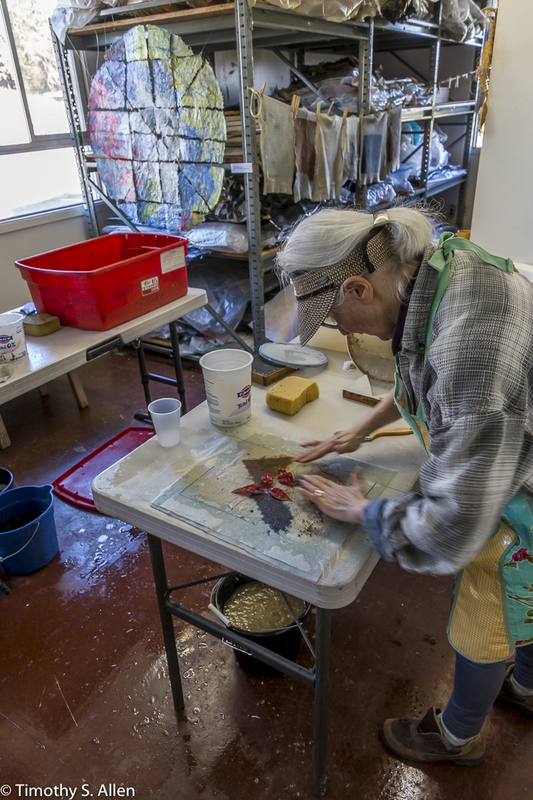 Those with no experience as well as experienced papermakers are welcome in this introductory class. Class size is limited to 5 students. 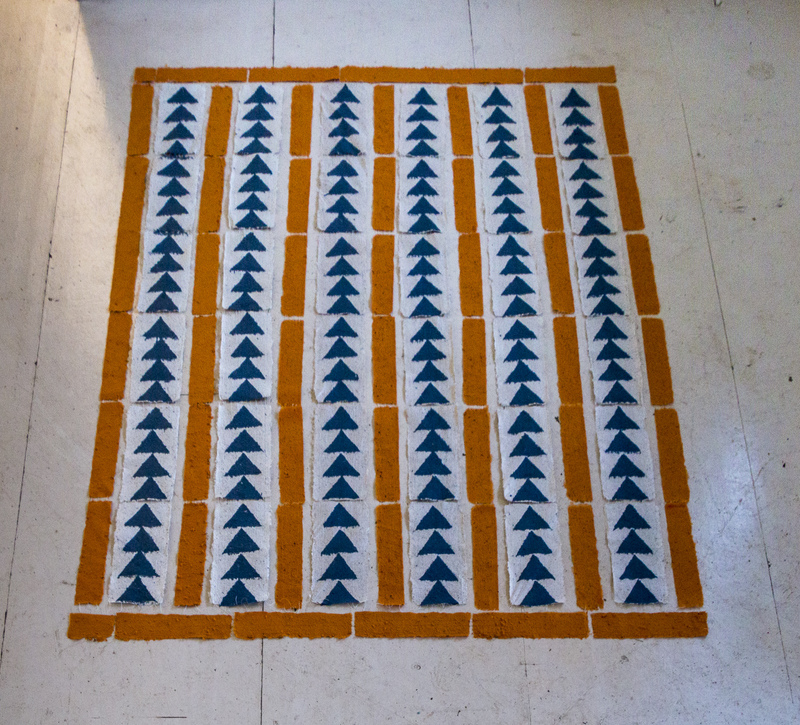 Workshop fee is $100 and includes cost of materials. Contact Jane by email at info@janeingramallen.com or phone 857-234-2432 to register. Registration and deposit of $50 must be received by June 9, 2018, and the balance of $50 can be paid at the class. Use PayPal (www.paypal.com) to send by credit card or send check to Jane Ingram Allen, 315 Algiers Court, Santa Rosa, CA 95409. 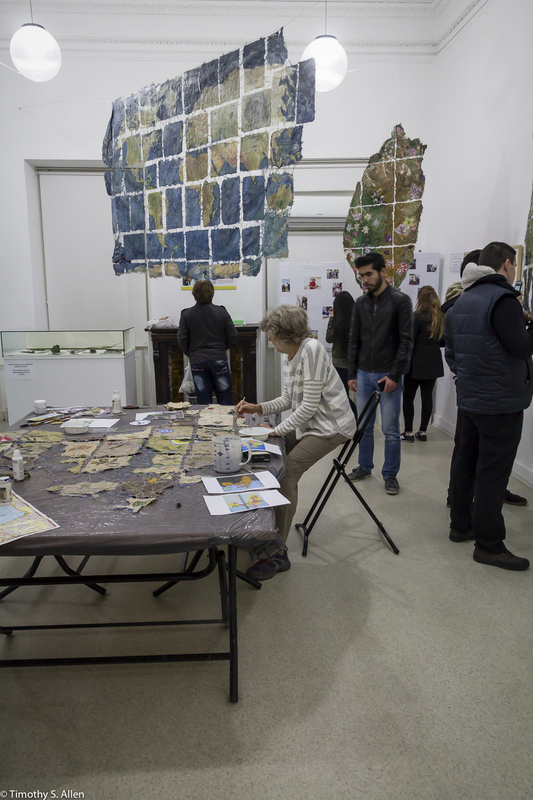 Jane creating mixed media Izmir Site Map with handmade paper from plants of Izmir, Turkey, during her 2015 Fulbright Specialist artist in residency at Ege University, Izmir, Turkey. 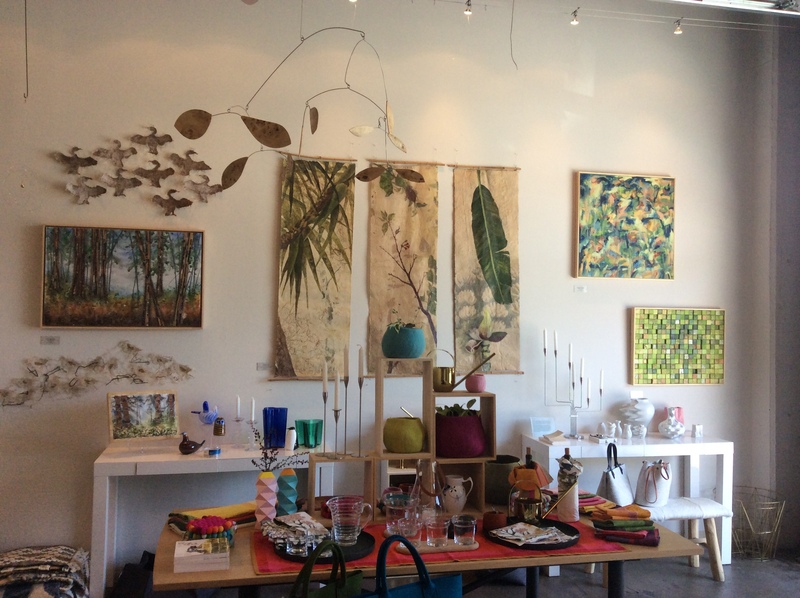 More of Jane’s mixed-media site map works hang in the gallery. Class size is limited to 4 students. Workshop fee is $200. Contact Jane by email at info@janeingramallen.com or phone 857-234-2432 to register. Registration and deposit of $100 must be received by July 21, 2018, and the remainder of $100 paid at the first class. Use PayPal (www.paypal.com) to send by credit card or send check to Jane Ingram Allen, 315 Algiers Court, Santa Rosa, CA 95409. I am happy to have my environmental or eco-artwork included in this article by Robin Meadows in the latest issue of ESTUARY NEWS. Keep watching this Blog for announcements about my eco-art quilt project with handmade paper and seeds for wildflowers in the pulp that is planned for a Santa Rosa, CA, park in early 2019.